Education Minister calls on IDF to open fire at those who launch incendiary kites and balloons at Israeli territory. 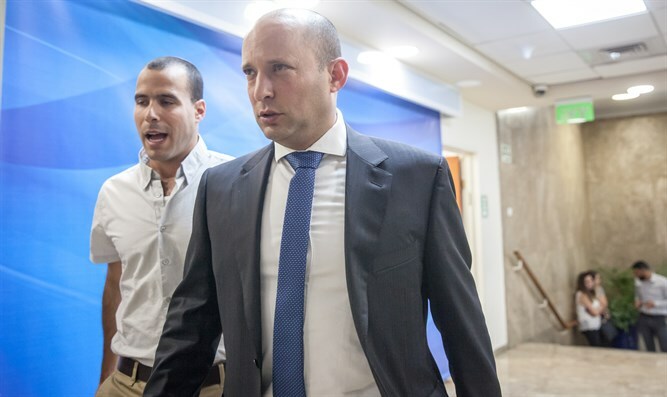 Education Minister and Jewish Home leader Naftali Bennett called on Monday to intensify the response to the phenomenon of kite terrorism from the Gaza Strip. At the start of the weekly Jewish Home faction meeting, Minister Bennett said: "During the past month there has been a wave of intense aerial terrorism against the southern communities, and on a daily basis, terrorists launch aerial devices carrying explosive charges or incendiary charges against Israeli communities." "Three weeks ago I slept at night in Kibbutz Kfar Aza and a resident of the kibbutz told me that a firebomb burned her yard while she was not at home, but her children were there," Bennett said. "The line between burning a yard and harming human life is thin, too thin." "Those who believe that there is no justification for firing at these aerial attackers. They say that it is only boys who are legally protected, that the international community will condemn us, and that this will lead to an escalation. We do not think that Belgium, France, or Bulgaria would agree that [terrorists] would launch aerial weapons at them and that they would launch aerial weapons at them and say that it would not be possible for them to [respond]. All over the world, they know that it is the right and duty of every nation to protect its citizens," he added. Bennett referred to what he called "the escalation argument" and said, "Restraint in the face of terrorism will inevitably lead to escalation, because the enemy interprets the restraint as if it has a space of blockades that if it only continues to launch kites with explosives and balloons, then everything will be fine." The Education Minister called on the IDF to shoot those who launch the incendiary kites and balloons. "I say this clearly: Kites of explosives and incendiary balloons are not children's toys. They are lethal weapons intended to kill our children. This is murderous terrorism by Hamas. Therefore, it is necessary to refer to an explosive balloon or to a burning kite as to Qassam fire. We have to stop firing warning shots and go directly for the target.